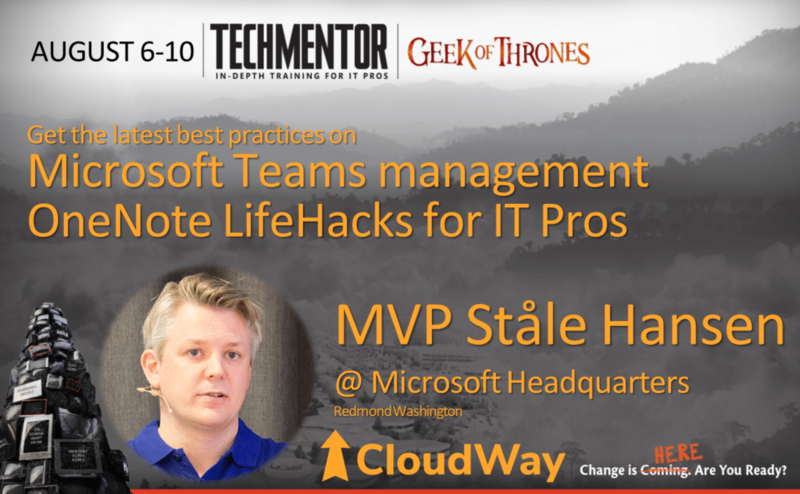 Our CEO and MVP Ståle Hansen is to do two sessions at Microsoft Headquarters, TechMentor August 6-10. He will share his experience controlling and reporting on activity using PowerShell for Microsoft Teams and share his OneNote LifeHacks. This session will help you learn how to take control of Microsoft Teams using PowerShell. You’ll be able to find activities across all workloads to create PowerBI reports and use the information to decommission, archive, or expire inactive teams. So you’re using OneNote as your primary note taking tool? Without any structure, you might lose track of all your notes. This session will help you learn how to get structured using OneNote to dump all your thoughts, ideas, e-mails and notes that are either actionable or something you want to find later. You’ll learn five steps to get started with a robust framework from using the sections correctly, take notes with your mobile device, use Microsoft Flow to send e-mail to OneNote from any device, and the Pomodoro Technique to prioritize and induce flow in a busy workday. The magic is to collect all information in one section regardless of the platform. TechMentor has been around since 1998 for a reason. It is just the right size – big enough to have a wide educational reach, but small enough to make the industry contacts and speak 1-on-1 with thought leaders. What to expect at the Microsoft HQ, Experience 5 full days of sessions and in-depth workshops taught by 3rd party instructors, leading independent IT analysts and Microsoft team members. Conference co-chairs Sami Laiho and Dave Kawula carefully vet the topics covered to ensure their relevance and usability to you! Plus you’ll be at the source, Redmond, WA, where you can have lunch with Blue Badges, visit the company store, and experience life on campus for a week!